Chris Meistre, Coastal Water Rescue, running in the February 2016 edition of the run. This year will be his 3rd event and he wouldn’t miss it for the world! The Dolphin Challenge, previously known as “Jbay2PE” has added another family event to the day’s offerings of extreme running or mountainbiking, and relay running. Sunday 11 December 2016 will now also in a family fun cycle. With interest being shown from all corners of South Africa in this beach celebration entries are starting to really take off. “We were not expecting too much interest this year, to be honest,” said race convenor Steven Lancaster. “Due to requisite permissions being granted late, we only started really marketing the event 3 weeks ago! The two sponsors that have come on board to make this edition of the Dolphin Challenge possible are 4Tech I.T. Solutions and Tavcor Auto Sales Jeep. Runners will start their 38km journey at the Kabeljous River start in Jeffreys Bay at 6am. 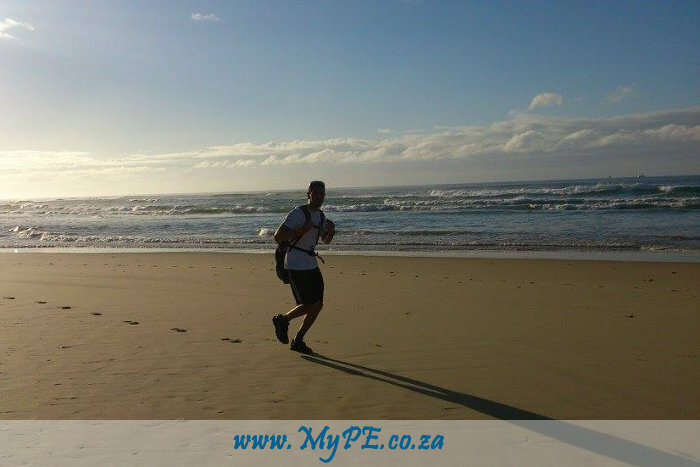 They make their way along the beach to Maitlands River Mouth in Nelson Mandela Bay. This includes the popular swim through the Gamtoos River where assistance will be provided by EC Coastal Water Rescue. The mountain bike events start and finish at Maitlands River Mouth. The course is out and back along the beach to collect a token at the Gamtoos Village checkpoint for the 50km extreme edition, and the family fun ride turn around at Van Stadens. This family ride gives an opportunity to families to enter and spend some time at the beach and in the saddle together. Entry for the family fun ride has therefore been pegged at just R50pp. The event has been renamed the Dolphin Challenge because the route looks like the back of a dolphin and Nelson Mandela Bay is the “Bottlenose Dolphin Capital of the world”. For individuals and the full distance mountain bikers this is considered an “extreme” event due to the minimal support and athlete exposure to the elements along the route; the more extreme the weather, the more extreme the event. There will be medical support for both runners and mountain bikers supplied by Eastern Cape Medical Rescue. The beaches on the route are pristine, and most people won’t get to experience their beauty unless it is through an organized event such as this. It is an opportunity to put your thoughts in perspective and to share an adventure with friends. A permanent number, prizes for position, and lucky draws will be handed out at the end of the event at Maitlands River Mouth. Entries are online and at select sports stores in Nelson Mandela Bay. There will be a R50 late entry penalty after 8 December. In store entries close on Wednesday 7 December and online entries at midnight on the 9th of December. Entry on the morning will be possible. T-shirts and water proof bags are being used to raise funds for beneficiaries through The Herald Christmas Cheer Fund & East Cape Coastal Water Rescue, so while we are able to run, ride and spread cheer, we are able to give back through exclusive memorabilia, too. These have to be ordered before midnight on Sunday 27 November.